Asked about the motivations and rewards of their work, the charcoal makers of Ishikawa Prefecture in Japan often mention a desire to contribute to halting forest degradation resulting from under-use and under-management. For the more elderly, this desire is rooted in childhood memories from around the mid-twentieth century, when, as children, they used to play and gather mushrooms in the sunlit forests surrounding the mountain villages of Ishikawa. Here, as elsewhere in Japan, the forests adjacent to human settlements had long been managed for firewood, charcoal, timber and non-timber products. The stands of managed deciduous woodland, known as a ′village mountain′ or satoyama, border the village and the untamed nature beyond, known as the ′back mountain′ or okuyama. Constant human intervention shaped them into spaces with clearings and broadleaved trees at different stages of regeneration, quite unlike the dense and dark tree cover characteristic of the mature forests of okuyama. The distinction between familiar satoyama and the more remote and unfamiliar okuyama runs like a thread through representations of the forest in Japanese culture. On one hand, folk tales and literature are rich in depictions of forests as wild and inaccessible places, populated by frightening creatures, both real and imaginary, like snakes, foxes, demons and humanlike beings with beaked faces and feathered wings called tengu. To ensure a stable supply of firewood, charcoal, timber and non-timber forest products, coppicing and other resource harvesting practices used to be carefully balanced with the forest’s natural rhythms of regrowth. On the other hand, a fondness for airy secondary forests that allow the sunlight to reach through the canopy, nurturing the carpet of flowers and herbaceous growth, seems to be common among the general public, as suggested by social science research, particularly in the field of forest tourism. For both local communities and the Japanese society at large, satoyama forests seem to be closely linked with a sense of belonging and cultural identity. At the same time, satoyama is attracting increasing attention for its elements of sustainable management of resources and ecosystem functions, which have been crucial to the food and livelihood security of local communities. To ensure a stable supply of firewood, charcoal, timber and non-timber forest products, coppicing and other resource harvesting practices used to be carefully balanced with the forest’s natural rhythms of re-growth. Forest management was functionally linked with farming activities, for example through the use of fallen leaves as fertilizer. The management practices associated with satoyama, which developed as part of communal land management in the Edo period (1603-1868) and continued until the years following World War II, not only increased the general amount of sunlight in the forest, but also created a diversity of habitats with different levels of light, which could sustain a rich biodiversity. Significantly, recent findings informing the Third National Biodiversity Strategy of Japan are showing that about half of Japan’s wild plant and animal species in danger of extinction live in satoyama landscapes. As the past ways of life associated with rural areas are disappearing and the Japanese countryside is increasingly being affected by depopulation and aging, the once sunlit forests of satoyama succumb to the intrusion of dominant fast growing species like bamboo. A revival of interest in traditional skills and crafts associated with forest management has been seen in recent years. The artisanal manufacturing of charcoal is one of the activities receiving recognition for its potential to contribute to the conservation and restoration of satoyama landscapes. Charcoal played a prominent role in Japanese life until the 1950s. Its production and use as a household fuel probably became widespread about 2,000 years ago, enabling the transition from the pit houses of the Jomon period (circa 14,000 to 300 BCE), which had hearths for firewood dug in the middle of the dirt floor, to the raised-floor dwellings of the Yayoi period (circa 300 BCE to 300 AD). Iron smelting furnaces relying on charcoal are also believed to have appeared about two millennia ago, marking the dawn of metallurgy in Japan. Throughout the centuries, charcoal was an indispensable factor in the development of diverse facets of Japanese culture, from cuisine and sake brewing to sword forging, medicine and makeup. It was the energy source that fueled the creation of Japan’s most magnificent manifestations of material culture, such as the great bronze Buddha at the Todaiji Temple in Nara, the casting of which is believed to have required one of the largest amounts of charcoal in history. In daily life, charcoal was most commonly used for heating and cooking. Until recently, traditional Japanese homes used to feature a communal room with an open-hearth fireplace (irori) where the family would gather to cook, eat and socialize. In addition, a variety of portable braziers and body warmers were developed, including ceramic or even wooden open charcoal braziers (hibachi), containers used to heat the feet or bedding (anka), hand warmers (teaburi) and portable body warmers (kairo). Charcoal occupied an important place in the lives of people of all social classes and in Japan’s economy as a whole. 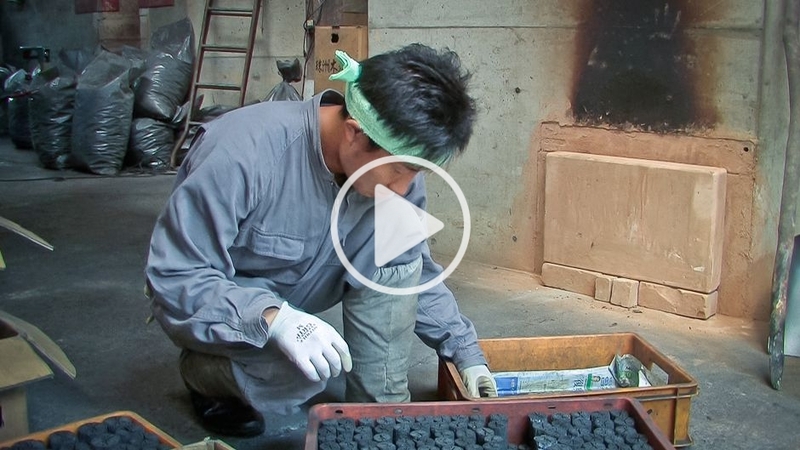 Charcoal making has a strong tradition in Ishikawa Prefecture, located on the Japan Sea coast. The former provinces of Kaga and Noto, which later merged to form today’s Ishikawa, became known as quality charcoal producing regions during the Muromachi period (1336-1573). In the Edo period (1603-1868), policies introduced by the Kaga Clan, who ruled the area successfully, ensured that the entire charcoal demand in the castle town of Kanazawa and the rest of the domain was met through local production. Charcoal was also an essential element of the tea ceremony tradition, which flourished among the samurai class in Kanazawa as one of the various artistic and cultural practices patronized by the Clan. It is in relation to the tea ceremony that charcoal making techniques were refined and approached the status of art. Charcoal was valued for both its utilitarian functionality and aesthetic appeal and ′tea charcoal′ (ochazumi), with its delicate chrysanthemum-like pattern, is still considered the masterpiece of Japanese charcoal making. After the Meiji Restoration in 1868, industrialization and the rise in living standards resulted in a higher demand for charcoal, spurring national and local government initiatives to enhance production through technological innovation. Around the turn of the century, charcoal was an important local export item for those Ishikawa villages with access to forest. Then, production fell dramatically in the context of the socio-economic changes that followed World War II, when electrification and propane gas use became widespread in rural areas. Demand for new housing in the rapidly sprawling suburbs of major cities caused many foresters to switch to fast-growing conifers to provide timber for the construction industry. The scarcity of employment opportunities in the countryside led to massive outflows of rural populations to the cities. With labor, knowledge and skills eroding at a fast pace, the decline of charcoal overlapped with the decline in satoyama. Several initiatives seeking to build on the past experience of quality charcoal making to counteract the factors responsible for forest degradation have emerged in recent years in Ishikawa, led by local communities, charcoal producers and local governments. Central to these efforts is a focus on traditional knowledge and on integrating it with socio-economic and technological innovation in order to preserve and regenerate forest areas. Related traditional knowledge includes the understanding of the seasonal cycles of the forest, techniques for cutting the trees and managing the remaining stumps in ways that ensure the growth of healthy new shoots, and knowledge on tree species selection that maintains and nurtures forest diversity. To ensure the economic viability of forest management initiatives that rely on charcoal production, the key is to identify and develop new markets. In conditions in which cheap import charcoal and other fuels are easily available from China and South East Asian countries, charcoal makers in Ishikawa are exploring new markets that focus, for example, on the health benefits or soil enrichment properties of charcoal. Until recently, traditional Japanese homes used to feature a communal room with an open-hearth fireplace ( irori) where the family would gather to cook, eat and socialize. One niche market that seems promising relies on the time-honored link between charcoal making in Noto Peninsula and the cultural tradition of the tea ceremony in Kanazawa City. Not so long ago, tea masters in Kanazawa paid little attention to where their charcoal was coming from, but now they are becoming increasingly interested in supporting local producers. A reforestation program is currently being run in Noto by Oono Choichiro, Japan’s youngest full-time charcoal maker, featured in the videobrief accompanying this article. Aiming to produce top grade tea charcoal from the wood of the kunugi tree (sawtooth oak), the programme is an interesting example of how cultural values can be fused with traditional ecological knowledge and entrepreneurial innovation. Charcoal makers in Ishikawa are interested in the debate on payments for the environmental services of managing secondary forests as CO2 sinks and biodiversity shelters. They also believe that increased awareness among consumers, of the role played by charcoal in conserving traditional landscapes, could add value to charcoal products. While meaningful as local efforts, such experiments are also instructive for universal issues around sustainability, such as redefining the relationship between production and consumption. How genuinely concerned can we become about the stories behind the things that we buy? What are we willing to pay for, say, environmental services or fair trade? How can we, as individuals, link our lifestyle choices with the values we treasure? And at a larger level, how can policy and action models be developed to robustly link these values to more environmentally-sound resource management? As it weaves together reflections of the sunlit and bio-diverse forests of satoyama, traditional forestry practices and the rites of the tea ceremony, the narrative of charcoal making in Ishikawa signals the urgency of these questions while attempting to offer a possible answer. This video was produced by Kaori Brand of United Nations University in collaboration with Ishikawa Prefecture as part of an initiative on traditional knowledge and the wisdom of satoyama/satoumi charcoal and salt making traditions in Ishikawa. Japan’s Charcoal Making Traditions Still Alive by Laura Cocora is licensed under a Creative Commons Attribution-NonCommercial-ShareAlike 3.0 Unported License. Like all of Kaori Brand’s films, that was outstanding in all ways. And I enjoyed the great article, too. I just hope these OW2.0 films get adequate viewership…they deserve widespread distribution.It is always a real boost to see satoyama, and people like the Oono family, being recognized for what is really an invaluable contribution to this world. If we only knew…and we’re beginning to, thanks to efforts such as this.It was particularly interesting in the film to see the two viewpoints portrayed which on the one hand were complementary, but on the other represented opposite approaches to satoyama revitalization: The Kanazawa University professor seems to represent the pragmatic approach of advocating for satoyama’s preservation as a result of the “services” it provides (with a distinct nod toward our contemporary worldview in which we’re compulsively drawn toward separating out and individually valuating/monetizing everything in order to justify its existence…otherwise it is an externality without perceived value to humans). He went on to say he hoped people continue to not simply stick with tradition alone and to continue innovating and coming up with new ways of working with satoyama services. Point well taken….versus…The Hattori cooking school person who specifically said that the traditional ways themselves represent the culmination of a great deal of experience and accumulated wisdom, and that in his mind they prove themselves on the palate compared to the use of newer approaches. A very valid point for taking the time to really understand what we’re so quick to call obsolete and leave behind.One advocates for services and technology and innovation, while the other advocates for conservation of traditions and respect for the knowledge of the past. And therein lies the tug-of-war we seem to be experiencing…the dualities and inherent risks are plainly evident. However, so long as they both maintain an overarching desire to preserve and protect satoyama then I can only hope a healthy dialogue and consensus ensues before firm decisions about changes/innovation/usage are made. Thanks. I just visited a place called Uchiko-town in Ehime Pref. They have a nice inn run by local housewives. I met a young couple moved from Chiba and the husband make charcoal for tea ceremony as well. Interestingly, he said that there are works in the country side, unlikely what people usually said. They don’t get as much money as in the cities, but they can make nice living in the country side without it.